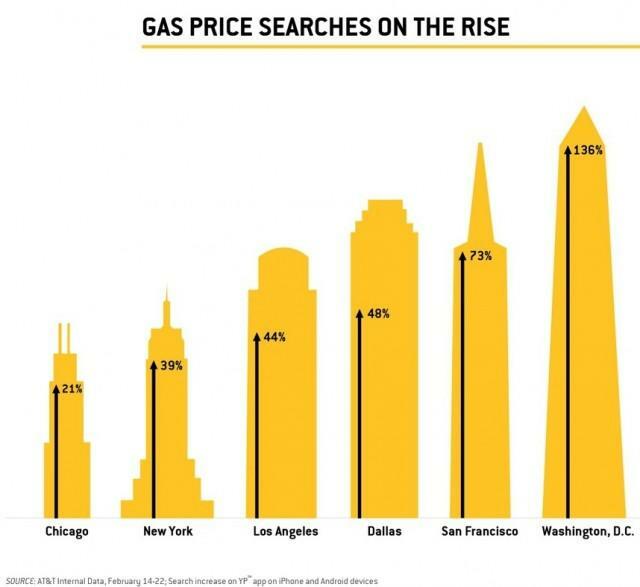 As gas prices continue to rise — they reach as high as $4.59 in Manhattan — drivers around the United States are turning to their mobile phones to find cheaper prices. The trend is so noticeable, in fact, that AT&T has noticed that the amount of downloads for its YP app, which includes a gas price search function, have grown exponentially. I recently spoke with Rohan Chandran, AT&T’s Interactive Executive Director of Mobile Products about AT&T’s smartphone applications, specifically YP, and how subscribers are using it more than ever for savings. First, a little history on YP: the application was born out of the legacy Yellow Pages book – something you might remember being dropped on your door as a kid (or still today, if you’re stuck in the middle ages.). “We took a great directory service and made it much more than that,” Chandran said, noting that AT&T is looking to use YP to shake up the local search space over the next 12-18 months. Most noticeably, the company is already seeing the app used first for restaurant searches and, more recently, to find lower gas prices. A user simply needs to open the gas price search application and YP automatically determines the gas stations in the immediate area with the lowest prices. Gas stations labeled in green offer the most savings. 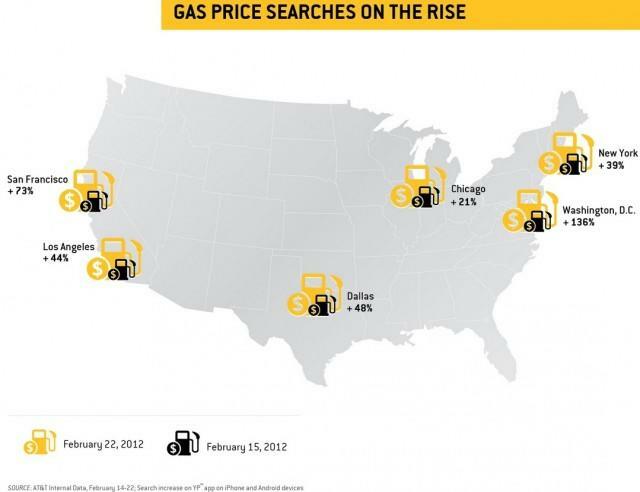 “Gas prices are a great example of where we’ve had sucesss in attacking local search,” Chandran explained, noting that AT&T has partnered with Opus for its search results. “We launched our gas prices solution in late August/early September of last year and it’s a huge hit.” So huge, in fact, that Chandran says drivers use YP to conduct more than 1 million gas price searches per month. Depending on a user’s location, AT&T estimates that drivers are saving about $400 per year using YP. YP is available for free for most devices, including iOS, Android, webOS, Windows Phone and BlackBerry smartphones. If you’re looking for an alternative, you may also want to consider some other cheap gas apps such as GasBuddy (4.5 stars after 293,000 downloads in the Android market), Clevertanken or WhatGas. Hopefully you’ll save some money filling the tank this summer, no matter what you choose.